Spring time is a great time to learn how to make a swim jig. Then again, just about anytime is a good time to learn How to Make a Swim Jig! Swim jigs are excellent fish catchers under a variety of conditions. They typically excel during times of the year when bass are shallow and active. So, spring, early summer and fall are usually the ideal times to use them. But, today’s blog post is not about how to use a swim jig. It’s about how to make a swim jig! So let’s get to it! The Trokar Weedless Pro Swim Jig is the swim jig that we will be talking specifically about today. It’s got a great head design and can be made with or without a fiber weed guard installed. It also features recessed eye sockets that allow you to glue in whatever style eyes you want, to give your swim jig a completely custom look and feel for the lakes that you fish the most. Dipping your new swim jigs in powder paint gives them a rock-hard finish that will stand up to just about anything you can subject them to. Rocks, weeds and timber won’t affect the paint, so you can fish your jigs confidently anywhere the bass live. Once the paint has dried thoroughly, and you’ve glued the weed guards in place with epoxy, then it’s time to glue the eyes on. You can get some really nice 3D eyes here: 3D Lure Eyes. Finally, once the eyes are in place, it’s time to give the jig that completely custom look with a skirt that’s tailored to the body of water where you’ll be using these nice new swim jigs to catch big bass. Below is a great video that walks you through the entire process of making your own swim jigs, from start to finish. 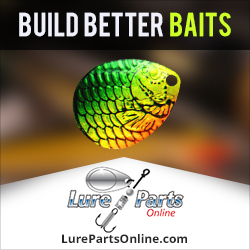 If you’d rather not get involved in pouring lead, you can simply buy jig heads that are already poured and painted. All you’d need to do then is to create your own custom skirts. You can find some super nice pre-poured, pre-painted swim jigs by clicking here. 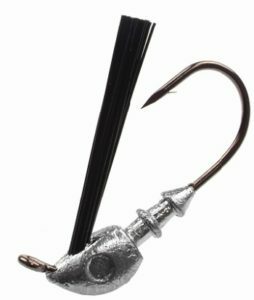 This entry was posted in Making Your Own Jigs and tagged How to Make a homemade Swim Jig, How to Make a Swim Jig, How to Make a SwimJig, How to Make Swim Jigs, How to Make your own Swim Jig on April 6, 2018 by Lure Parts Online.